If you read our previous post, you’ll probably be wondering how to turn off the LinkedIn “Profile Stats” feature, so that random websites can’t find out who you are, where you work, and what you do. 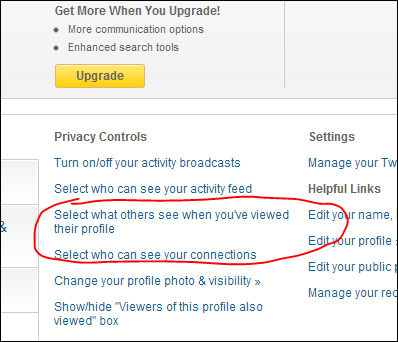 Luckily, LinkedIn does provide a way to disable (at least, anonymize) the feature. And select the “anonymous” option. You’ve probably noticed that this option is discouraged, as you’ll lose the benefits of “Profile Stats”… but it seems worth it to me! This entry was posted in Consumerism., Technology. on May 21, 2013 by I'm a Super .com.